Be the first to share your favorite memory, photo or story of Eulalia "Sue". This memorial page is dedicated for family, friends and future generations to celebrate the life of their loved one. Eulalia Elizabeth Butler, daughter of Louis and Kathryn Maag Westhoff, was born, July 30, 1921 in Brunswick, Missouri. 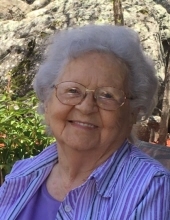 She departed this life, on Thursday, August 2, 2018, in Lakeside Meadows, Osage Beach, Missouri at the age of ninety-seven years, and three days. On March 5, 1940 in Kansas City, Missouri, she was united in marriage to Paul Kenneth Bachtel and to this union four children were born. On May 10, 1974 in Miami, Oklahoma, she was united in marriage to Paul Alvea Butler. Together they shared the past forty years of marriage till his passing, November 3, 2014. She was preceded in death by her parents; her husband; two sons, Robert “Bob” Bachtel and Larry Bachtel and her siblings, Ferdinand Joseph “Bud” Westhoff and Helen Teresa Clavin. She is survived by her daughter-in-law, Bonnie Bachtel of Montreal, Missouri; her two sons, Ronnie Bachtel and fiancé Susie O’Dell of Kansas City, Missouri and Dennis Bachtel and wife Lou Ellen of Brentwood, California; her step-children, Patricia Chester of Kansas, Pamela Thiel of Kentucky, Richard Butler and wife Cheryl of Kansas and Wayne Butler and wife Dana of Missouri; sixteen grandchildren; numerous great-grandchildren and great-great-grandchildren and a host of nieces, nephews, other relatives and many friends. Eulalia was raised in the Kansas City area where she graduated high school and had attended two years of college. In 1987 she moved to the Camdenton area and has always called this her home. She was a retired bookkeeper and office manager. In her spare time, she loved playing games on her computer. Especially Solitaire, which she could be found playing until the late hours. She enjoyed sewing items of all kind and camping. Christmas was her favorite holiday. She loved everything about it. She would not let her family do anything that day. Sue loved to square dance and had wanted to do so on her birthday, but her health did not allow her. Eulalia made a profession of faith and was a member of Community Christian Church. She was a loving mom, mother-in-law and grandma and has bestowed her family with many memories and blessings that they will forever treasure. We celebrate her life and her many accomplishments. Funeral services will be held at 11:00 a.m., Tuesday, August 7, 2018, in Allee-Holman-Howe Funeral Home, Camdenton, Missouri. Burial will follow in Allee Memorial Gardens. Visitation will be from 10:00 a.m., until time of service in the funeral home. To send flowers or a remembrance gift to the family of Eulalia "Sue" Elizabeth Butler, please visit our Tribute Store. "Email Address" would like to share the life celebration of Eulalia "Sue" Elizabeth Butler. Click on the "link" to go to share a favorite memory or leave a condolence message for the family.